But, water damage can be brutal to those nice boots of yours. Winter and spring weather is no friend to leather, and if ya’ ain’t careful, you can end up ruining those beloved cowboy boots. 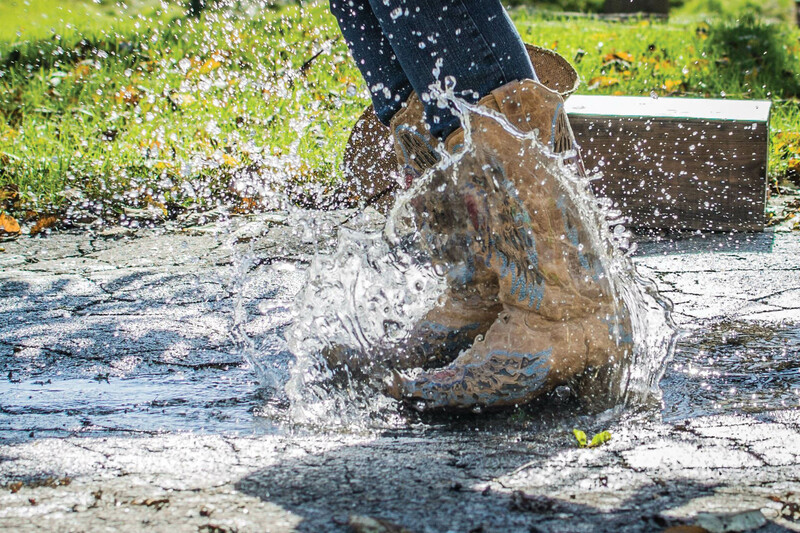 Even though cowboy boots are meant for hard wear-and-tear, mud puddles and treacherous trails, their lifespan can be cut short if not taken care of properly. Cowboy boots, when exposed to moisture for a prolonged amount of time, can result in leather that is stretched, discolored, cracked, wrinkled and reeking of mildew. Water diminishes the integrity of the leather, turning it moist and drying warped – never to be the same shape again. If you do indeed get your boots soaking wet, you have to be careful how you dry them! Don’t place your waterlogged cowboy boots next to a high heat source, like a fireplace, heater vent, blow dryer, or wood burning stove. It is a sure-fire way to ruin em’. High heat can melt any protectants or adhesives used on your boots, and further distress the leather and warp the sole. So, resist the urge to warm your cold, tired feet by the fire like an old-school rustler. Always remove your boots first, and let them air dry in a warm dry place. High quality cowboy boots, like the ones you’ll find at Harry’s Boots, are made of the highest quality leather, and their top-of-the-line craftsmanship makes them basically waterproof, for the most part. However, if you want your boots to last years, or even decades, it’s important to apply some form of water protectant. Thoroughly clean your cowboy boots with a dry rag and brush. Double check with the boot manufacturer to see if they suggest a particular protectant for their brand. Always test a small, less predominate area of the leather with your waterproofing method of your choice before using it on the entire boot. Oil based products tend to darken lighter leathers, so make sure there are no discolorations or unintended results. Most quality leather conditioners are water repellent in themselves. Oil naturally repels water, so keeping your boots well conditioned not only keeps them pliable and looking nice, it prevents water from seeping into the fibers. That doesn’t mean you should jump into a lake wearing your cowboy boots, but dampness won’t be a problem if you’re vigilant about conditioning your leather. When applying the conditioner use a soft towel (like a chamois or terry cloth) and gently rub the conditioner into the leather using a small circular motion. The amount you need is not an exact science and varies from boot to boot, depending on the dryness of the leather. You know you’ve used enough when the conditioner has stopped absorbing and a thin layer covers the surface. Allow the boots to soak overnight, or for at least 12 hours, then wipe away any access oil with a dry rag. The boot coloration may seem darker for a few days as the conditioner gradually absorbes. Depending on the age and type of boot it is, and how much you wear them, you’ll want to condition your boots about once a month. Waterproofing sprays are quick and easy, but if they contain silicone, you risk drying out the leather. So, when using a waterproofing spray, look for a non-silicone, or low-silicone protectant. The spray can be used after conditioning and creates a slick, clear, waterproof shield around the leather. The benefits of spray protectants are the convenience, and you don’t risk discoloration. It usually only takes 30 minutes to dry. Sprays are great for suede and exotic leathers, and are UV resistant so the color remains fresh. Mink Oil is the most popular suggestion for waterproofing leather boots. The fatty acids in the oil make the leather supple yet durable, protecting the leather from external abrasions and moisture. The application process is a little more time consuming than a waterproofing spray, but is much healthier for the life of your boots. Mink oil was first used by early hunters who applied it to their leather boots to make them more flexible and water resistant, and is now used in the production and preservation of the finest leather goods in the world. The application is simple, just massage the oil into the leather, and warm it with a blow dryer (on low) or set them in the sun. This helps soften the oil allowing it to soak deep into the fibers and stitching. Wipe off the excess oil and allow the boots to dry overnight. NOW GIDDY-UP AND GIT TO SPLASHIN’! DID THIS ARTICLE HELP YA’ BE THE BEST COWBOY OR COWGIRL YOU CAN BE? There’s a whole lot more Texas tips & tricks where that came from! Just subscribe to our newsletter and receive all kinds of country livin’ advice, western spice and boot bargains right to your inbox.